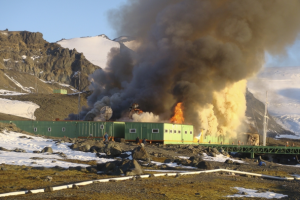 RIO DE JANEIRO, BRAZIL – A fire broke out at Brazil’s Antarctic research station, Comandante Ferraz (EACF), on Saturday killing two people and forcing the evacuation of around forty more by helicopter. The two victims have been named as Carlos Alberto Vieira Figueiredo and First Sergeant Roberto Lopes dos Santos. The Comandante Ferraz (EACF) base ablaze on Saturday, photo by Divulgação/Universidade Federal do Paraná. A third officer, First Sergeant Luciano Gomes Medeiros, was injured in the blaze but his condition is said to be stable. The exhausted survivors were returned to Rio de Janeiro’s Galeão Air Base in the early hours of Monday morning to be reunited with their families after the ordeal. According to preliminary reports by the Brazilian Navy, the fire is believed to have broken out in the machines room which houses the generators at the base. They are investigating the possibility of a short circuit being the cause. 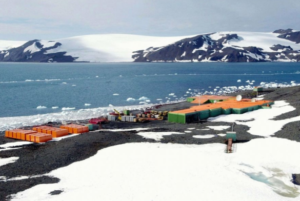 The Brazil EACF Antarctic Base before the fire, photo by ABr Archive. They also confirmed that the two bodies had been found and were being repatriated to Brazilian soil. President Dilma Rousseff has offered her condolences to the families of the victims and her thanks to Chile and Argentina, who were quick to assist in the emergency. According to Frederico Cezar de Araujo, the Brazilian ambassador in Chile, the Argentinean Air Force was instrumental in the evacuation of the survivors to the South American continent, where the Chilean force opened up its air base in Punta Arenas to receive them. The Chileans also provided helicopters and medical assistance to the injured party. On Saturday, the Brazilian navy also confirmed reports, published in the Estado de São Paulo newspaper, that a ship carrying 2,600 gallons – the equivalent of 63 barrels – of arctic diesel to the Comandante Ferraz station was sunk in a storm thousand yards from the shore where the base is located. The Navy said that the fuel tanks are intact and have not leaked, and a ship is being sent to recover the sunken vessel. They could not confirm when the ship had sunk, but the newspaper report claims it happened in December last year.